A banner in the East Stand called for new heroes to match the exploits of the 1991 cup winning side and the players delivered. Every one of them played their part in a great night of attacking football that swept away a poor Dundee United side. With Craigan on the bench following his NI appearance 24 hours earlier and Saunders injured we lined up with a makeshift defence but the were hardly troubled. The game started at a frantic pace and we attacked the South Stand end that held over 3,000 United fans. They were to be disappointed that their favourites didn’t justify the hopes that were kindled when United fought back twice in the first game at Tannadice. Humprey was first to show a goal threat when he cut inside and fired wide after 3 minutes. His success on the right wing was to be bettered by Murphy on the left 5 minutes later. Sutton headed on to give Jamie an opportunity from the left side of the box and he struck a sweet shot across Pernis into the net. The Travelling fans got a good view of that one and they saw a second in 36 minutes. It was a mirror image of the first. This time Sutton’s head flick from Hammell’s cross from the left fell for Humphrey and he smashed the ball home from the right hand side. United had their best spell for a short period between the two first half goals but Randolph had little to do. He stopped one long range effort and watch as another flew harmlessly over the top. 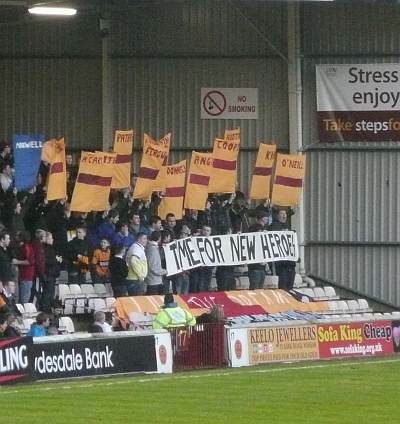 By the break it was clear that Motherwell were by far the better team. There was a combination of good wing play down both flanks, a willingness to pass and at times to use Sutton’s superiority in the air together with a determination to recover the ball when possession was lost. Lasley and Jennings were immense in midfield. United made a spirited attempt for a time in the second half but their efforts were directed more at presenting a physical challenge rather than playing good football. There were a few niggly tackles though the game was never dirty. Jeffers killed the game with a clinical strike on the hour. From the 18 yard line he delivered a low ball just inside the ‘keeper’s right hand post. This time the fans in the Cooper Stand had the perfect view and the big away support knew the game was up. The big crowd produced a fine atmosphere and contributed to a fine night’s entertainment (for the home fans at least). There might be a lesson to be learned for the benefit to be gained for reducing prices and having no live TV coverage! 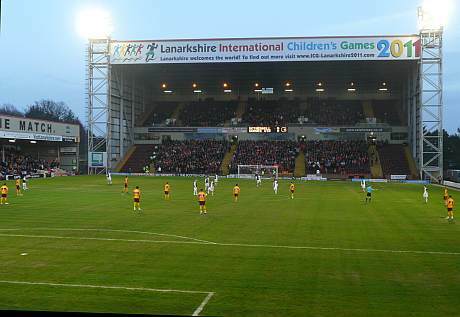 Motherwell have to regroup for another big game when Aberdeen visit of Saturday. Players’ thoughts of a trip to Hampden will have to be held in check for a while but ‘Well fans can start to plan for a big day out on April 16.